Crestwood High students in years 9 & 10 feasted on a gothic treat when steampunk author, Richard Harland, joined them for a 6 week in-school writers residency which started on Friday 12 February 2016 and extended over two terms. Phase one is now complete. It kicked off with a look at locale and setting then Richard lead right into character creation before students made a start on their own stories. While the residency is ended we look forward to sharing some of the results with you soon! 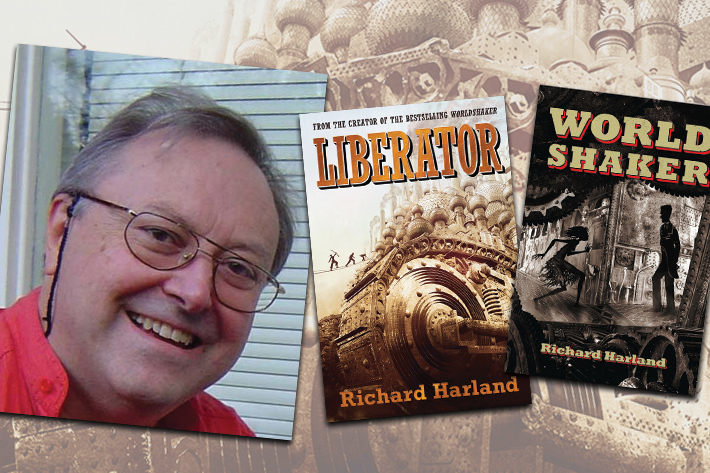 Richard Harland is an internationally best selling author who has written fantasy for all age levels, from children’s (the Wolf Kingdom books, SassyCat and Walter Wants to be a Werewolf) to YA/crossover (the international breakthrough series, Worldshaker and Liberator, plus the Heaven and Earth trilogy) to adult (The Vicar of Morbing Vyle and its prequel The Black Crusade). He has won five Aurealis Awards, including one Golden Aurealis for best Australian novel in any category of SF, fantasy or horror, and has also had several listings on the Children’s Book Council’s Notable Books list. Crestwood High School is in the north-western Sydney suburb of Baulkham Hills. It values the creative arts in all its forms which attracts students from the local area and well beyond. With the school’s appreciation for individuality, students are encouraged to reach high to discover and extend their talents. A perfect match for Richard Harland. Meanwhile these students of the writers’ residency can expect to reach deep into the guts of story telling, they will, over the 6 weeks explore with forensic detail the elements of a story and flesh out a tale or two of their own. We can’t wait to see the results of this writer/school pairing! Richard Harland was born in Huddersfield, England, and migrated to Australia in 1970. After several years as a singer, songwriter and poet, he became a lecturer in English at the University of Wollongong. He resigned to become a full-time writer in 1997. He now lives in the south of Sydney. His first book was the comic horror novel The Vicar of Morbing Vyle, which has since become a cult classic. In 1997 he began the Eddon and Vail series, which combines a science fiction world with detective thriller stories. Following on from his international breakthrough series, steampunk novels Worldshaker and Liberator, comes Harland’s latest in the steampunk genre, Song of the Slums (2013).